Building fire codes and safety standards prove vital to the well-being of your business and its employees. Fire inspections allow you to fix any problem areas before they become a problem. Fire safety starts with prevention and includes detection and suppression. To prepare for your fire inspection, inspect your fire safety equipment. Test your smoke alarms and ensure the batteries are changed and fully functioning; remember to change the batteries each year! Check your fire extinguishers to ensure they are fully charged, visible, and accessible to all employees. 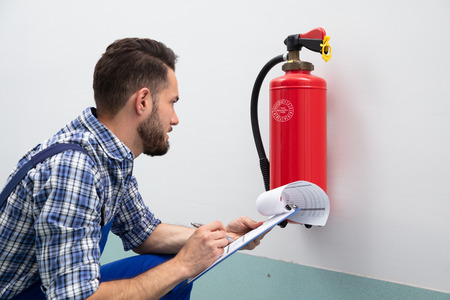 Allow a technician to service and inspect your extinguishers and inspect your building’s sprinkler system to ensure that all sprinkler heads are intact. Electrical fires can be common in businesses, so one important area to check before your fire inspection is your electrical equipment. Verify your junction boxes and circuit breaker panels have metal covers and that they are clearly labeled. Look at the space around your breaker panels and clear a path where anyone could shut off the breakers quickly if needed. Do a sweep of your building for exposed cords with signs of fraying or splicing. Avoid extension cords where possible and use multi-outlet surge protectors for computers and other hardware. The most important element of fire safety is ensuring your employees are well-educated on the emergency procedures. This starts with a fire plan that all employees learn and understand. Make sure to clear pathways to exits and free stairwells from obstructions. Keep maps posted highlighting paths to emergency exits. Do not lock exit doors during business hours and double check that your emergency lights and exit signs are working properly. Conduct fire drills periodically throughout the year so all employees feel comfortable knowing where to exit in the event of a fire emergency. If you’re looking to install a new fire sprinkler system in time for your next fire inspection, trust in the professionals at Fire Tech Residential Sprinklers LLC. We’re your number one source for high-value sprinkler systems in Maryland. Contact us today to learn more about our fire sprinkler systems!